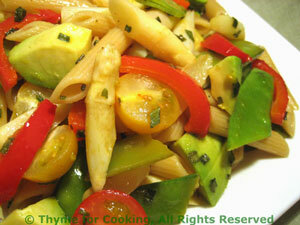 Pasta Primavera Salad, Thyme for Cooking spring salads. This is a colorful salad for spring. I used white asparagus, as that is more common here, and both yellow and red tomatoes. Trim and cut asparagus into 1 inch lengths. Trim and cut snow peas in half. Heat olive oil in large nonstick skillet over high medium high heat. Add vegetables and stir-fry for 2 - 3 minutes until just crisp-tender (longer if you prefer, but, remember this is a salad!). Remove and put into a large bowl. Cut cherry tomatoes in half and add to vegetables. Cut avocado, remove pit. Remove half of avocado from shell, cut into cubes and add to vegetables. Whisk together mustard and vinegar. Slowly drizzle in olive oil, whisking until thick. Pour over vegetables and toss to coat (tongs work well). Add pasta, toss to combine and serve. Note: To store a cut avocado, leave in the shell and put cut side down on a plate. Use within 2 days.